For the last three years we’ve seen a growing number of faithful readers who not only read, but also contribute by sharing the articles, writing comments and sparking conversation with their peers. Some even wrote stories and articles for this blog. That’s great! Today, I want to share with you a new project I’m working on and I ask you to join. In my working life I’ve stumbled upon one conundrum of our profession time and again: there are really great books and online resources about best practice in collections management – the wonderful 5th Edition of Museum Registration Methods readily comes to mind, but of course there are much more. You read what is best for the artifacts, how to treat them, document them, store them… These books are written from the perspective of ”best practices“ and as we all strive to reach the best for our collections, that’s a good thing. Only that the starting position is often all but ”best practice“. Take Antony Aristovoulou ‘s story ”Match-ball for the Registrar“ as a prime example: being contracted for relocating and registering a collection of tennis artifacts and discover that all is stored in one giant shipping container and you have to start from scratch, including sourcing locations and material. All too often, especially for small and middle sized museums with historical, agricultural and/or science and technology collections there is a gap between what is written in books and the real world. Reading about best practices is great and necessary, but standing in an old shed with a leaking roof and heaps of rusty things that were euphemistically called an agricultural collection in your contract you are miles away from taking your acid-free cardboard and start building a custom box for a single artifact. To make a long story short: I’m about to write a practical guide to manage previously unmanaged collections. This book will be written with the worst case scenario in mind, starting with nothing than a collection in peril and working step-by-step towards improving the situation 1. It will be written for the practitioner in the field who has to deal with all possible and impossible circumstances while trying to get her/his collection managed. Especially it will be written for people who are thrown into this situation without having it done before – may it be job starters or colleagues who have only worked in larger and/or well organized institutions so far. This is where you, the readers, come in. This book will be much better and encouraging with real world examples. Sure, everyone loves to be the best practice example but what I’ll need here are examples of how difficulties were tackled and how issues were resolved. How collections that were in peril were brought to a better stage. Maybe still far away from being ”best practice“ but still much better than before. 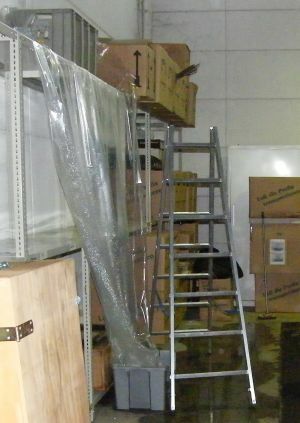 I’m collecting all kinds of worst case examples, brought in from veteran museum professionals young and old who have encountered unbelievable situations in collections management (I’ve seen a main sewage pipe right above the shelves of an archive, so, the possibilities are endless…). Every now and then I will present you some aspects I’m writing about here on this blog and will ask for your experiences and thoughts. It would be great if you would be willing to share them. I promise that I won’t abuse your willingness to share and will always check if the way I want to use some of those examples in the book is acceptable for the original author and her/his institution. This is such a fantastic idea! I have been making something of a career of assisting small, all-volunteer institutions with their unmanaged collections, and I would LOVE to be able to point them toward a book that is designed to help them take first steps, especially with a limited budget and access to professional assistance. I would be overjoyed if I could assist you in any way with this book by sharing any of my experiences, solutions, horror stories, etc. Good luck! I have been working on a project for around 6 months now beginning to get to grips with a previously unmanaged collection in a British local authority run museum. I’d be happy to contribute if it would help. Alongside all the issued others have identified (and it’s nice to know I’m not the only one) I’ve found managing expectations and changing behaviours is also an issue. If a collection has been unmanaged for several decades I will not be producing a fully searchable online catalogue with images within 2 years. Also managing the collection does mean we cannot take everything people want us to and you will need to fill in this documentation correctly! Worst case scenario? Try this one. An all volunteer museum that began collecting items in 1991. Since then the collection has grown to somewhere close to 500,000 pieces; there have been 5 diffirent amature curators and dozens of volunteers; the records have been all paper based using at least 6 diffirent numbering systems; both the records and the collection have been physically moved 3 times and at present the records and the collection are located in 2 diffirent locations; the Museum has not been open for over 10 years and the collection is housed in a borrowed space, mostly untouched since it was put into boxes in a very hasty and unorganized manner; now we’re open again as a Museum in a third location and I am the basically the only one charged with accessioning and registering these items and putting them into an organized manner that will at least slow down the deteriation of our library/archives/photo/objects collections and get them into an electronic program. All on a very, very tight budget. Help!!!! Thanks for sharing and good luck with your collection! I’ve just dropped you a mail. Hi Ron, I think you may have won the prize for worst case in Documentation! many people are using FileMakerPro for museum databases-it is fairly easy to set up, and takes both text and photos. If you can, try to find out the exhibit history of artifacts (how long, how much light, did they travel? for example. This will help in selecting less damaged objects for future displays. I am a conservator specializing in museum surveys for collections care; I have written an article called “What to Do When You Can’t Afford to do Anything”-if you send me your email I will gladly send it to you. It contains sources of supplies for the US and Canada. I can’t wait till your book is written! I’ve been managing the same collection part-time for 18 years and still have quite a ways to go. When I came on board as the first professional curator, the collection had already been growing for 30 some-odd years. There was a minimal paper trail, sometimes just consisting of post-it notes or notes on scraps of paper. I spent the first 15 years improving the physical condition of the collection; shelving, boxes, sealing the basement storeroom, improving drainage, etc. Now I am moving forward on intellectual control. Professional standards are necessary but not always based in reality when one is worried about keeping bats out of the piano. Kudos for constantly pushing your collection towards better standards. It’s the consistend work over years that makes all the difference. Good luck in gaining intellectual control. I only discovered your blog a few months ago and totally love it. It is great to see so much experience shared without borders and always interesting how things done in one part of the world can be applied anywhere else. I have worked in a couple of exhibit and storage upgrades in the past and I am just finishing a contract with a small history museum in Western Canada where for two years we surveyed a collection that had not been cared for, or managed properly, for many, many years. 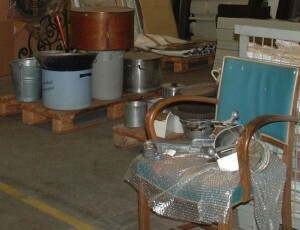 The collection has everything from huge machinery and industrial equipment to delicate tea cups and First Nations art. The storage facility is off-grounds, not climate controlled, overcrowded and, up until a year ago or so, only had the cracks in the back wall to serve as emergency lighting (not kidding). Sounds like it fits your description to the T.
A few years ago I started taking photos of the changes that happened during these types of projects, as things got moved, cleaned and rearranged. I have some interesting images I could share, specially if you have a specific topic in mind or something you want to illustrate but maybe have no photos of your own. Send me an email and we can figure out how I could help. Oh, it sounds really fitting and I can relate (yes, even with the cracks, only that they were missing stones in a brick wall…) I’ll drop you a mail. sounds like you’ve found a great way to give them a basis to start from given the limited time and resources. Great idea for a book on this topic. I am a volunteer registrar at a small museum on N. Wales. When I took over records were (mostly) in Excel. Now transferred to MODES. I have catalogue numbers for most items but some (about 25% – mostly photographs) have no donor / lender details or date of acquisition. Most frustrating. We undertook to do retrospective documentation as part of accreditation. But for some items I have no clue where to start. Some people involved with the collection left the museum before I joined and have not responded to e-mails etc. Another problem has been with copyright on photographs etc. A very good idea and hopefully an useful instrument for people who have to manage previously unmanaged collections in the future! During the period between 2005 and 2009 I was project manager of a rather huge deaccession project. When I started the project I noticed that we had to deal with an enormous various collection situated in a former laundry building. The storage, not build for museum storage and not situated adjacent to the museum building was one of the main reasons why the collection was not managed properly for some years. I would love to join you in your interesting journey. So if you are interested in our project (incl. practical solutions – where to start?/ open communication about the project i.g. by an exposition about deaccessioning/ pictures) feel free to contact me. This sounds really interesting and I’d love to hear more about this project. I’ll drop you a line. I was the Director of Collections and Programming at an agriculture museum. When I came on board the collection hadn’t been inventoried in 15yrs, and more than 85% had never been cataloged in the first place. There’s more to the story – if you’d like to chat I’d be interested in participating. this sounds like a good story! I’ll drop you a line. Angela, this is excellent! I’ve been in historical collections that were in exactly this situation as well as been in an art museum with a particularly troublesome piece made from animal bones…I would love to try to contribute a write-up about these experiences. I love this idea because I’ve thought about creating a document that is geared towards practical collections care for people who can’t do full-on museum storage for their personal collections but could also apply to those coming into a situation like you describe. Something about stages of care…thanks for taking this on! this sounds good. Yes, I hope this will be a handbook practical enough to help people to get a start at improving their collection. Of course, a collections manager’s duty is never done, but my focus is to say: don’t look yearning at the perfect storages of big art museums, just start doing something about YOUR collection TODAY and keep improving. When I began my tenure as Collections Manager at a state university’s Historic Textile & Costume Collection (very part-time in 2006) donor’s weren’t required to sign a gift agreement form. The collection, about 60 years old, had “loans” from people long-dead as well as other organizations in which the staff had completely changed. Accessioning was in full swing but de-accessioning…. non-existent. I put together a donor agreement form and contacted a reputable auction house to begin creating a more select collection. We still, however, have debates and the need to pare down the Collection’s size. I’d be happy to contribute more if you would like it. What a great idea – I’m looking forward to reading more. this sounds indeed very interesting. You are right, one key issues is to define what belongs into a scope of a collection and what doesn’t. If you just take “everything” you are in trouble soon. That’s why it is so important to put a collections policy into place. I’d love to hear more about your endeavor! Often what we should be asking is how to improve conditions in storage/display. Many years ago I participated in a ICCROM course with African delegates. Who said to me I know that lighting museum by candle light is not best practice but without electricity we have no other options? which had a storage area below the nearby river water level. The river had flooded and caused significant water and mould damage. thank you so much. Yes, this is a good example. You always have to look which materials are available and how you can achieve a maximum of object safety under the given circumstances! I would love to exchange some thoughts. das ist ein großartiges Projekt. Es gibt im Sammlungsbereich viel zu wenig praktische Anleitungen und Handreichungen. Es freut mich sehr, dass Ihr so etwas aufziehen möchtet. Vielleicht kann ich auch ein Beispiel dazu beitragen: wir haben vor sieben Jahren angefangen, die große, ziemlich unorganisierte Sammlung eines großen Unternehmens aufzuarbeiten. Schreib mir ein kurze E-Mail, wenn Du Interesse hast, dann kann ich genaueres erzählen. vielen Dank. Ich habe Dir eine Mail geschickt, würde mich freuen mehr über diese Sammlung zu erfahren. You have a wonderful and much needed project, and timely too! I will be embarking on a new project to assess / evaluate an unmanaged defunct museum collection. I’ve taken initial photos of the storage areas and have found the typical problems of incorrect storage such as a 120 year old crocheted bedspread folded up as tightly as possible and stored in a cardboard box. Evidence of old pests on textiles, items in full sun, assorted types and weights of hats jumbled in a large box, stored in unheated concrete warehouse style of building in Canadian winters, storage rooms are not secure in a public building, etc. I’m ‘itching’ to begin the project to sort it out and make sense of it. Of course the budget is really low and the oversight committee are non-museum folks. I can contribute various aspects of this project to your book if required. thank you so much for chiming in. This sounds indeed like a collection that holds many good examples. I drop you a mail and maybe we can exchange thoughts in the process. From what I’ve gathered, the defunct museum operated for 30+ years by well meaning non-museum volunteers. No donor information or inventories and everything was jumbled together in a room for tourist viewing in a unheated space. When it closed in 1999 many folks felt that their families stuff should be returned and literally walked in and took it home. In 2006 I volunteered my expertise to sort the collection and provide elementary storage solutions, to a great effect I could see the vast majority of the items are beyond hope of keeping. I took images of the original storage condition (literally a town employee would take a box at the end of a shelf and sweep his arm over the contents to dump everything into a box. I will look for these images. OMG, sounds terrible… and terribly interesting! Maybe some inspiration can also be found in the ReOrg-method for storage reorganisation developped by ICCROM, aimed at converting overcrowded storage-spaces into workable safe storage. More information and lots of examples you can find on the project-website http://www.re-org.info/en. Later this year I hope to be attending an ICCROM-workshop on the ReOrg-method in Brussels. As a consultant in preventive conservation I often encounter unmanaged collections in professional and non-professional heritage organisations in Flanders (Belgium). A joint approach of these collections should be developped. I’m looking forward to your guide. Let me know if I can help. Would it be possible to get a copy of your article in Museum Magazine? Thanks Jürgen for pointing me to ReOrg. I think this is a good approach for storage reorganizations. This sounds fascinating – looking forward to seeing how it develops! Ja, das ist ein wichtiges Problem. Auch ich hatte schon mit derartigen “textilen Neuzugängen” in unserem Museum zu tun. Ein wichtiger Arbeitsschritt beim Aufnehmen einer neuen Sammlung ist die prophylaktische Stickstoff-Begasung, um ein Einschleppen von Schädlingen zu vermeiden. Weiterhin finde ich es wichtig, dass jegliche Hinweise auf frühere Behandlungen mit Bioziden dokumentiert werden, d.h. Aufheben/ Dokumentieren von in der Nähe des bisherigen Ortes der Objekte gefundene derartige Tütchen, Mottenpapiere, Informationen uä.,um den weiteren Umgang mit den Objekten zu bestimmen oder eventuelle Reaktionen am Objekt erklären zu können. Ist die Sammlung erst einmal vom bisherigen Ort entfernt, sind solche Informationen meist verloren. Ich hoffe, diese Hinweise helfen weiter bei der Problematik. Für eventuelle Rückfragen stehe ich gern zur Verfügung. vielen Dank für die Hinweise! Genau, das Dokumentieren sämtlicher Hinweise, die zur Sammlung gehören könnten ist sehr sehr wichtig und leider wird oft viel zu schnell erst einmal etwas weggeräumt und weggeworfen, obwohl es ein wichtiger Hinweis war. I was so glad to come across this. I am a seasoned art museum curator who has worked in medium to large institutions who (generally) have it together regarding collections management. For the last year I have been the director at Andalusia Farm, the home of Flannery O’Connor. We steward 544 acres and 12 historic structures on this former dairy farm and the picture you paint of unmanaged collections fits us to a T. Less than one month into my tenure, a tree fell on an already compromised 3200 sf historic Equipment Shed. It was filled to the brim with all manner of tools and implements, farm machines, broken furniture, random kitchen ware, architectural salvage, horse tack, and various mysterious bottles with weird liquids etc. So yes! Your book is sorely needed and we are happy to provide stories and photos of this and other ‘collection’ finds (e.g. the graveyard of rusted farm machinery, the hillside of buried gin bottles near a rumored still, the textiles in Flannery’s chiffenrobe). Happily we rescued the items from the Equipment Shed and are currently rebuilding the structure but are still faced with what to do with the thousands of items ranging from hand forged nails to a vintage tractor. Let me know how we can contribute to your effort. Thanks. Thanks Elizabeth! Love to be in contact with you and wish you and your team all the best in tackling this enormous job! I may be able to help with this, please drop me an email. dropped you a line. Thanks for the offer! While visiting the small museum in Folsom, New Mexico several years ago I wished I had a copy of the book you are about to write. The situation may have changed since I was there, but I would love an excuse to travel back there for some documentation. There were huge holes in the roof of the building, allowing rain, snow, and myriad insects to get into a historic building featuring local historic artifacts, books, fossils, and natural history specimens. I hope that this book would benefit not just the museum professionals working on on contract who are confronted with similar problems, but also those folks who run the small places with grand items that need attention, too. Actually, I hope I write as cleary and hands-on that you don’t necessarily need a museum studies degree to understand it. And I will try to point to professional resources where someone who is new to the field can find some help. We have a collection that would be a great example for the book. Let me check in with the project manager and see if she wants to write it up for you. That sounds wonderful, thanks a lot, Deb! Hello Angela. This project sounds like a great idea, the basic “GUIDE TO MANAGING A COLLECTION” type of book. I will be happy to contribute ideas and photos as I have experienced these issues since 1968. Oh, and today is my 65th birthday – see my Facebook page for details. ANYWAY, everyone should start out with a camera and take hundreds of images from every conceivable angle of the material before anything is touched. General photos of the room, the piles, the damages if any, then closeups of everything. This documentation is like archaeology – documenting the items the way there were found and later it helps to clarify any relationships. It also has side effects of being evidence for insurance purposes, legal purposes, historical purposes, etc. Well done! thank you, I’m looking forward to your contributions! Yes, when working with an unmanaged collection your first approach is “hands off”. I already introduced the mantra “Take more pictures – touch less things” in one of the first chapters. It’s a great danger to destroy connections – physical as well as those who have to do with provenance – when moving things too fast and too early in the endeavor.